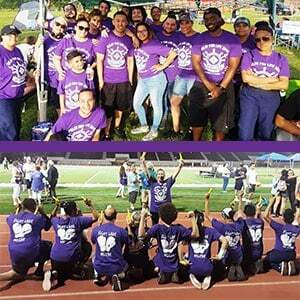 June 16, 2018, Clifton, NJ – The Relay for Life has become a cherished tradition for students and staff at American Institute’s Clifton, NJ, campus. For more than ten years, massage therapy students have provided complimentary massages to participants in the annual fundraising event, in addition to taking part in the 24-hour relay and raising funds to support the American Cancer Society. This year’s theme – “Pirates of the CURE-ibbean” gave students and staff a chance to wear patches on one eye and bandanas on their heads, and the best-dressed pirate won a prize. The massage therapy students were especially happy to find more cancer survivors receiving complimentary chair massages this year. Massage therapy can be beneficial for cancer patients once they have achieved certain milestones in their recovery. Through fundraising prior to the event, the American Institute team raised just over $1000 to support the American Cancer Society’s research into finding a cure. “Hearing the stories and knowing that someone else got through diagnosis and treatment is so important. It’s personal for our AI Family,” said Mrs. Muse.